It is wrong and incongruous for a radical publication like Workers Vanguard to line up with the media and academic establishment against Wikipedia (Wikipedia: A Million Monkeys Typing, 16 March 2007). Clearly Wikipedia has no place in scholarship or the courtroom—but neither does any other encyclopedia! (And, no, Jimmy Wales Voltaire!) Wikipedia is, however, a valid source for informal information seeking and sharing. While it has serious quality control problems, it is less biased and more informative than mainstream alternatives. While you scream blue murder over minor Wiki hoaxes, you quote with approval the New York Times, which was caught redhanded in the WMD mass deception. You also endorse defamation law, which has always been used to stifle dissent and to protect the rich and fatuous. You dont have to buy the guff about digital democracy to see the Internets potential for voluntary, non-commercial, co-operative activity. And contrary to your argument about scientific accuracy and authority, reputable scientists do use open websites to bypass the monopoly of academic publishers. The Left should be making use of this opening, not backing big business and intellectual insiders. So much for your socialist and democratic credentials—but then that was summoned up in the headline about a million monkeys! We knew that our article on Wikipedia, which is available on our Web site, would ruffle some feathers. If Niall C. and others want to use Wikipedia for informal information (i.e., information you cant trust), so be it. Unfortunately, Wikipedia does not describe itself with such modesty. We will add that it is absurd to claim that because we quoted the New York Times, were somehow alibiing their role in the governments weapons of mass destruction lies. Deceit, manipulation and cynical spin are part of the normal workings of the bourgeois system and its media mouthpieces. Nonetheless, what the Times wrote about Wikipedia—that there are dozens of accounts of people editing entries to suit their own business or personal interests, or their biases—is undeniably true. And the Times, unlike Wikipedia, can be held accountable for its reporting, since it has an editorial board made up of actual people with real names. As for the claim that we endorse defamation law, we note, as Karl Marx and Friedrich Engels taught long ago, that bourgeois law sanctifies and protects the dictatorship of the capitalist class. And defamation law is no different. On principle, we oppose bringing the bourgeois courts into the disputes of the workers movement. In 1981, we defended the British Socialist Organiser, then the newspaper of Labourite leftist Sean Matgamnas Workers Action grouping, against a lawsuit by the political bandit Gerry Healy and his Workers Revolutionary Party outfit, which often resorted to Britains notorious libel laws to silence political opponents (see Healyite Libel Suit: An Attack on Workers Movement, Spartacist [English-language edition] No. 31-32, Summer 1981). At the same time, we have used and will use such laws as possible to defend our party and the workers movement more broadly against the forces of the class enemy. See, for example, Moonies Forced to Retract Deadly Libel, in WV No. 345, 6 January 1984. 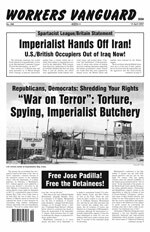 We successfully forced a retraction out of the sinister Moonie cult and its Washington Times, which charged us with provoking violence after a labor/black united-front mobilization we initiated brought out more than 5,000 people to stop the Klan from marching in Washington, D.C., on 27 November 1982. U.S./British Occupiers Out of Iraq Now!